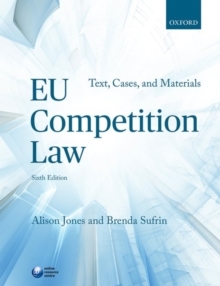 The essential guide to EU competition law for students in one volume; extracts from key cases, academic works, and legislation are paired with incisive critique and commentary from two leading experts in the field. In this fast-paced subject area, Alison Jones and Brenda Sufrin carefully highlight the most important cases, legislation, and developments to allow students to navigate the breadth of legislation and case law. With their clear explanations and commentary, the authors provide invaluable support to students as they approach this complex and highly technical area of law.